As a follow-up to the Cloth Diapering 101 post, I wanted to let everyone know about an exciting awareness event that will be happening round the blogosphere in October. 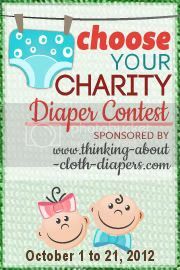 The Choose Your Charity Diaper Contest aims to get the word out about cloth diaper companies that go above and beyond in their morals, charitable focus, and giving back. You will be introduced to company after company whose motivation is to bring about positive changes in the world. I would love for everyone to get the word out via Facebook, Twitter, Google+, and word-of-mouth. Heck, send a snail mail letter if you think it will get someones attention! Let me know who your favorite cause-focused diaper companies are, and I will be writing reviews for mine and sharing them with you very very soon. Here's to having a positive impact with the choices we make!